Each of those scans will show 100 stocks with the most alerts for the selected day. Note that when I say "most bullish" or "most bearish", that means "biggest number of" not (necessarily) the most likely to go up or down. 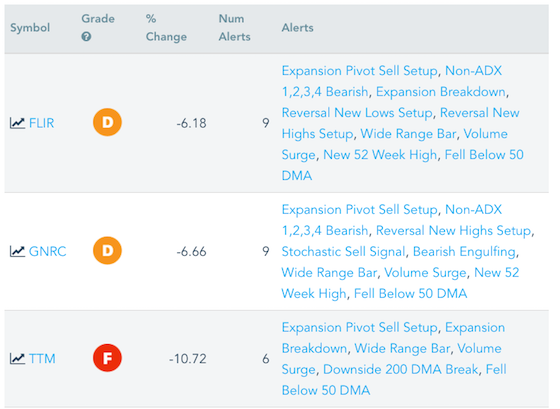 It's likely that the many of the stocks on these scans will not be in an ideal buy (or short-selling) point the day that all the alerts show up. But depending on the type of setups you like you should be able to find a few good trading candidates. Others can be added to a watchlist so that you can be alerted once they form setups more to your liking. The result list of these scans is a little different than the other scans. As you can see above, the columns on these scans are: Symbol, Grade, Percentage Change (on the day of the alerts), Number of Alerts, and the Alerts for that day. As always, you can hover over (or tap on) the little chart icon to get a quick preview of each stock's chart.